Because the Williamsburg area boasts nearly 400 years of European settlement and hundreds if not thousands of years of Native American habitation prior to that, anywhere you step just might be in the fossilized footprint of someone who went before. The minds behind Two Rivers Country Club (part of the Governor’s Land Residential development) certainly discovered that fact, when some of the property’s history threatened to delay, if not destroy, completion of their golf course. Of course the 18th followed suit a few months later. And the completion of the course was well worth the wait. 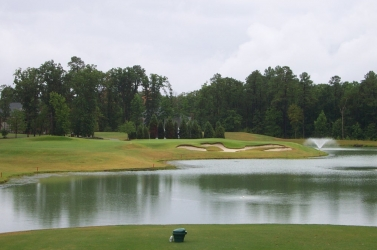 Two Rivers is a private country club with three holes along the banks of the aforementioned rivers, and the balance winds in and out of some serene woodlands, open space and peaceful residential neighborhoods. It’s got the consummate private club feel. 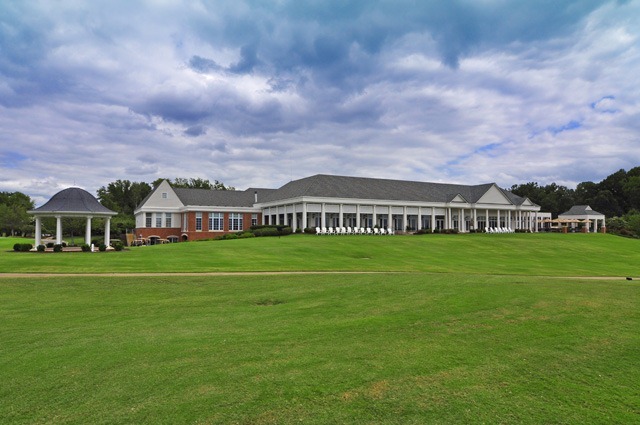 “The property developer, Dominion Resources/Dominion Land, was really committed and dedicated to producing a distinctive type of development — not just for golf, but for the entire residential community. When you mention the word Williamsburg, the name just connotes something special and unique. That was attractive to me from the start. And when I went and saw the property with the two rivers right there, I knew right away it was an opportunity to work with spectacular views and settings,” Fazio added. One thing that’s great about the club when you’re out on the course, you really aren’t bothered by a lot of outside influences. Being located in a private residential community, there is never going to be too many distractions when you’re playing. The golf course will always be in great shape, and it provides a real fair test of golf. Another important issue is how the golf relates to its surroundings: “You also want the golf course to have good setbacks from the residents, so the golf is not interfering with the development, and the development is not interfering with the golf. That’s not easily accomplished, but you must have space to make that happen. In each particular case, a blending of the golf course with the environmental constraints and issues of the property involved,” Fazio said. It’s clear the right ingredients were mixed together at Two Rivers. Fazio said there was also a unique opportunity to work open spaces into the overall community plan, which enhances the ‘feel’ of the club. It works together well. The houses are setback a generous distance from the course and protected by a thick buffer of trees in most areas. Standing on the tees, you won’t see many homes, which gives the course a real parkland feel. It was surprising to begin with two tough holes to open the round. The first is a 440 yard par four that doglegs left, playing uphill on both shots. Here you’re first introduced to Fazio’s challenging green complexes. The green’s not exactly a plateau, but it slopes down from all sides into a bunker on the left or a chipping swale in front, or rough to the other sides. Two Rivers certainly eases up after the first few holes, but not on the course’s first par three, number four. It measures 208 yards from the tips and requires a full water carry to a large, undulating green guarded by a bunker in front and right. Club selection is pivotal because long’s not really an option — if you’re over the green, it’ll roll in the water. The back nine is highlighted by the finishing three holes, but the twelfth is also an excellent par four. The longest two-shotter on the back, it plays 430 yards and dead straight, with tree lines on both sides and bunkers guarding the fairway. Here too, the green is well guarded with a bunker on the short right and grass depressions all around. 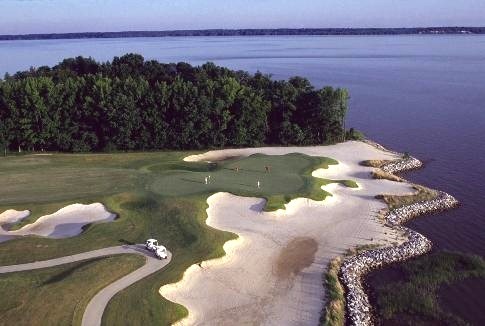 The closing three holes are nothing short of spectacular, with a river view rivaling Kingsmill’s and some good golf holes to boot. For club members, that need not be the conclusion to a visit to Two Rivers. The club has a 90 slip marina, tennis courts, full service locker rooms, a dining room and a grill room. The community has several pools and miles of walking and biking trails. Definitely the slower pace you’d expect from living in Williamsburg. Finishing up — today, there are no signs at the 18th hole commemorating the difficulty Fazio and the rest of the folks endured to complete this excellent golf course. And the skeletons were safely and peacefully relocated nearby. A fitting resolution to a problem, as well as a great golf experience, no bones about it. 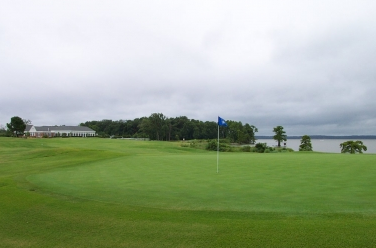 Memberships are available — and you do not have to own property at Governor’s Land to be a member of Two Rivers Club. Contact Rob Collins, Membership Director at (757) 565-5421 for information.